The Pew Research Center has posted its State of the News Media 2012, and for anyone still pulling for print, it’s not a pretty picture. 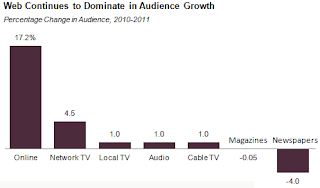 Online news sites saw their audiences grow by 17%; network, cable and local TV news saw increases in viewers; even radio news attracted more listeners. But magazine readership dropped a fraction, and newspapers continued their decline, by a full 4%. · More than half of smartphone owners (about 44% of all adults) use it to get news. · People are returning to TV for their news. The three network evening news shows now attract 22.5 million, up 4.5% in a year. · CNN and MSNBC saw significant gains; Fox News, still the leader with a prime time audience of 1.9 million, saw a decline for the second straight year. · The revenue trends were even more polarized: online news sources saw increases of 23%, while newspapers experienced a decline of over 7%. Surprisingly, the amount of non-digital news produced seemed to expand on many fronts. More local TV stations added very early morning news shows, beginning as early as 4:30 a.m., setting a record for the amount of daily news programming on local stations (over 5 hours). And new magazine launches outnumbered those that folded by 239 to 176. The one medium that shrank, of course, was newspapers, which continued reducing their size and the amount of space given to news coverage. The revolution continues. Stay tuned.